Price isn't the only thing when it come to getting your Transpore products, experienced customer service is priceless! 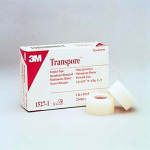 Surgical Tapes by Transpore are perfect for fixing any wound care dressing to any wound and are useful for securing wound dressings, tubing, and catheters. These surgical tapes are comfortable and porous, and the can be stretched to accommodate swelling and movement. 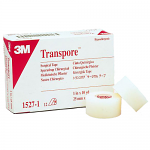 Sportaid offers superior quality surgical tapes from international brands like Transpore. Sportaid has a vast collection of reliable and effective options to ensure proper prevention and protection from infection. 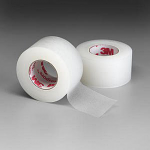 You can find a range of sizes of Transpore Clear Plastic Perforated Tape at Sportaid, so browse through our selection of Surgical Wound Care Tape or feel free to call 1-800-743-7203 for expert assistance, and stay protected by choosing Sportaid as your wound care supplier. Sportaid is the best place for Transpore as you can find savings up to 31%!